The Modern Nonprofit uses well-designed programs whose designs have included community input making them easier to manage and more likely to have solution-oriented impact. Community participation will increase long-term sustainability. 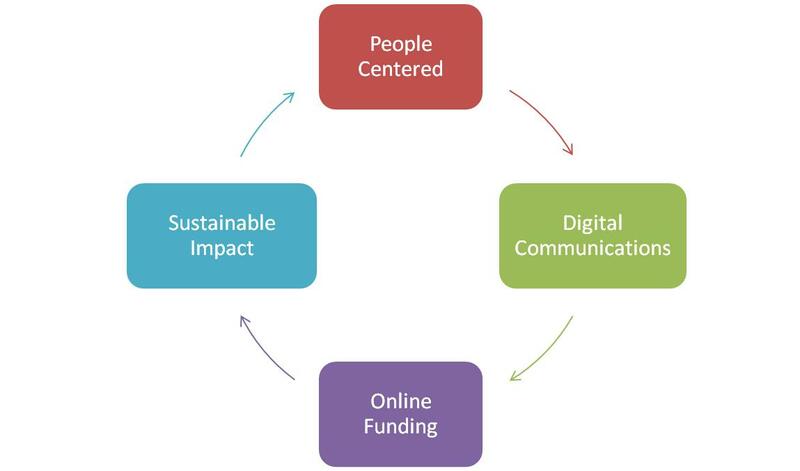 The modern nonprofit operates in an efficient cycle. They start by getting input from stakeholders for a proposed project or program. This input will lead to an appropriately designed project for addressing the challenges identified. The dialogue will provide compelling stories for use in their donor communications plan. A well executed communications plan will lead to improved funding for their program. A well-designed project will be easier to manage and will provide the impact needed to solve the prioritized challenges. Stakeholders participating in the project will be encouraged by positive results to sustain successful project activities. STEP 1: PEOPLE. The people centered approach to modern nonprofit project success. People are key to understanding nonprofit challenges and solutions. For example, if you are an environmental group, engage with local stakeholders to really get the full, multi-faceted picture. If you run a food bank—engage with your constituents to learn their wants, needs and desires—and how you can best design a program to fulfill them. A people centered approach will both provide captivating stories for donors and long-term sustainability for your programs. Learn more. STEP 2: COMMUNICATIONS. A digital communications plan will draw new participants and donors into your programs and build your support base. Honest, intimate and emotionally compelling stories captured from your constituents in Step 1 will captivate donors. Programs become more compelling to donors when community input has been included in program design. Modern, digital platforms are less expensive than mailings and allow you to track successes. Email newsletters, social media, and call-to-action webpages will convert website visitors into supporters. Learn more. STEP 3: FUNDING. Online funding can be super-efficient: you just need to be set up. Today’s highly effective donation pages have very specific tangible requests: a homebuilding nonprofit working in Central America might ask for $100 for a wood cook stove or $50 for a water filter for a family of six. But, don’t think raising funds only means donations. You can also sell things that relate to your nonprofit: consciousness-raising workshops, project tours—or a product like coffee if your work is in protecting rainforests—or vegetables if you run a community garden. Learn more. STEP 4: SUSTAINABLE IMPACT. A solid program design that included community input will be easier to manage and be more likely to have solution-oriented impact. Constituent participation will increase sustainability: If constituents feel that they were listened to during project design, they will be more likely to maintain the momentum of project activities that led to positive impact—long into the future. Learn more. CSDi provides hands-on training resources in the four key areas above. STEP 1: PEOPLE. Learn about community-based project design for funding, impact and long-term sustainability. Mentored Program. Nonprofit Program Management, Funding & Sustainable Impact. STEP 2: COMMUNICATIONS. Learn about modern nonprofit communications in the digital age. STEP 3: FUNDING. Learn about online funding: call-to-action webpages and donation pages. STEP 4: SUSTAINABLE IMPACT. Learn about designing, funding and managing projects so that positive impacts are sustainable. See our complete course catalogue. 15,000 people from 208 countries and territories subscribe to our newsletter. Advance your career, raise funds & solve nonprofit challenges with our cutting-edge articles.